Does caffeine get you going in the morning? Or keep you going all day and night? The popularity of coffee isn’t new, but featuring the preparation of this liquid energy has become a focus in many kitchens. Some call it a coffee station. Some call it a necessary convenience for their morning routine. Whether you go all out with an espresso machine or just dedicated cabinet and counter space for your coffee fix, there are plenty of options to consider. One of the must haves in a coffee station is to have coffee mugs handy. The idea of keeping them in a drawer is new, if you have drawer space available. Having a deep drawer with a nonslip liner in the bottom keeps your coffee mugs from getting chipped, something that happens all too often when put in regular cabinets or drawers. It also keeps you from having to keep your mugs on open shelves, which could lead to them falling and getting broken. 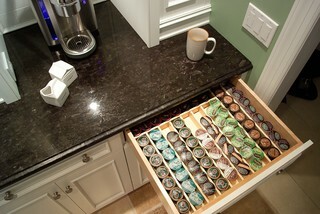 Addicted to your Keurig machine, but not sure where the best place to store your K-Cups might be? If you don’t want a rack on the counter, you can have a small drawer under the counter beneath your Keurig, they actually create drawer inserts made specially for your K-Cups. They even let you organize them by flavor and brand. If you’re more of a Nespresso person, there are special wood capsule storage units. They can be put in a drawer or even hung on a wall. The arcs built into them allow you to organize the capsules in such a way that the colors can actually create their own kind of art. If you have the space, you can just go all out and create a breakfast station. You can have a cabinet that hides away the toaster and other appliances, and perhaps even a small refrigerator for milk, juices, and breakfast items that need a fridge. You could also have storage for small plates and glasses. Coffee lovers can also end their day by winding down with decaf. Or perhaps you enjoy tea when you unwind. Don’t forget hot chocolate for those cold winter nights. A dedicated beverage area can be used for multiple purposes throughout the day and night. These are just a few ideas to consider for a coffee station. Of course, this also applies to tea lovers. Perhaps you can keep a small electric burner in a cabinet along with the teapot or whatever you use to boil water. No need to use the regular stove just for breakfast. 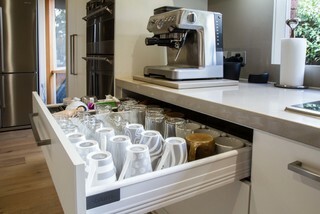 There are plenty of more coffee station ideas on websites such as Houzz. Do you have any creative ideas on how to create the best coffee, tea, or breakfast station for you? Let us know! If you need help with creating a coffee or breakfast station, Kitchen Views can provide for all of your cabinetry and countertop needs. Whether you want to add a few cabinets to an unused area to create a coffee station, or incorporate it in a new kitchen, we can help you design whatever you need. Whatever you decide is a must have in your kitchen, you can always ask your kitchen designer for advice in making your daily routines more convenient.